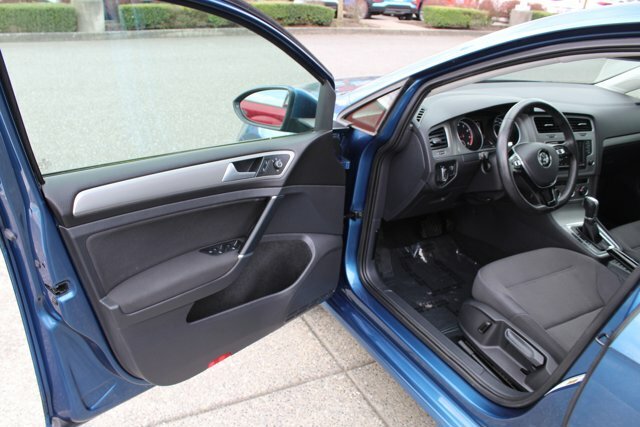 Find a great sale price on this 2016 Volkswagen Golf TSI S 4 Door at Jack Carroll's Skagit Hyundai in Burlington Washington. This 2016 Volkswagen Golf is located at our Hyundai dealership in Burlington. We also serve the cities of Anacortes, Bellingham and Mount Vernon. So if you're looking for a great price on this 2016 Volkswagen Golf TSI S 4 Door or just looking to get an auto loan for the vehicle you want... you've come to the right place! Jack Carroll's Skagit Hyundai. 2016 Volkswagen Golf TSI S 4-Door Silk Blue Metallic 4D Hatchback FWD 6-Speed Automatic with Tiptronic 1.8L I4 Turbocharged DOHC 16V ULEV II 170hp Only 8.5% SalesPanoramic Sunroof! , Backup Camera!, LOW MILES, Bluetooth!, Alloy Wh,eels, Titan Black w/Cloth Seating Surfaces, ABS brakes, Comfort Front Seats, Compass, Electronic Stability Control, Emergency communication system, Heated door mirrors, Illuminated entry, Low tire pressure warning, Radio: Composition Media w/6.5" Touchscreen, Remote keyless entry, Traction control, Wheels: 15" Lyon Alloy. Hassle Free Pricing! We believe in our "Buy Easy, Drive Happy" pricing philosophy which means you get our MVP great price right up front! All vehicles are fully serviced and safety inspected and reconditioned to our high standards!